Clearly, the Universal Circle Dance is a mixing bowl full of everything imaginable under the sun. Growing in popularity at an alarming rate. As we have learned, the Native American, New Ager, Wiccan, Christian, Kabbalist, Messianic and Muslim all preform a type of circumambulation. The Circle Dance happens to be the most popular these groups choose to worship their deity/deities. The Universal Circle Dance goes right along with, Prayer Circles, The Sacred Honoring Circle, Sacred Wisdom Circle, Prayer Circles, Global Prayer Circle, Worldwide Prayer Circles, Illumination Circles, Community Prayer Circle, Linking Circles, Mary Prayer Circles, Healing Circles, Gathering Circles, Sufi Healing Circles, Spiritual Healing Circles, Conscious Living Circles, Abram�s Circle Dance, Celtic Circle Dance and the list continues to grow! Many believe the Jews, Muslims and Christians, all believe in the same deity. They call him, Ha�Shem. It is not a matter of if, but when they unite under the one that will come in place of (anti-messiah) the real Mashiach, Yahushua. They also believe that he is in the midst of the circle. Not only is Satan the Father of lies (Yohannan/John 8:44) but we are told in the great book of Revelation 12:9 that he deceives the whole world. Satan and his messengers appear as messengers of light but it is a delusion. That is why Yahushua Ha Mashiach has told us to "Stay Awake" (Revelation 16:15). There are two types of sin. One is to sin unknowingly, that is to sin by mistake. Let's say I partook of the circle dance because many others were doing it; everyone claimed to be believers in Yahushua Ha Mashiach; I wanted to experience Israeli (Hebrew) roots and thought this would be a fun way to do it; I wanted to be part of a community; was told this is how David Danced (Davidic Dancing, note: David did indeed dance, but he danced filled with the Ruach Ha Qodesh, as the Ruach led him not some pre-planned danced steps); etc. What I did not know is that Sabean worship (circumambulating) is pagan, therefore I did not known I was worshiping Yah El'Shaddai as the pagans worshiped their deities. When we sin unknowingly and learn of this after the fact, just simply repent (turn back around to Yah and turn away from the sin). We need to ask for forgiveness in our High Priest's name, Yahushua Ha Mashiach. Renounce our involvement, then be joyful that the truth has freed us. The other type, is to sin knowingly or defiantly. To me, I would be defiantly sinning against Yah Elohim of Yisra'el if I participated in the circle dance. Why? Because I can not worship the Set-Apart Eloah as the rest of the world worships their many deities. What I can do is, dance, sing, and praise him as the Ruach Ha Qodesh leads me to do. This picture is taken from a Yoga and Arts web-site. 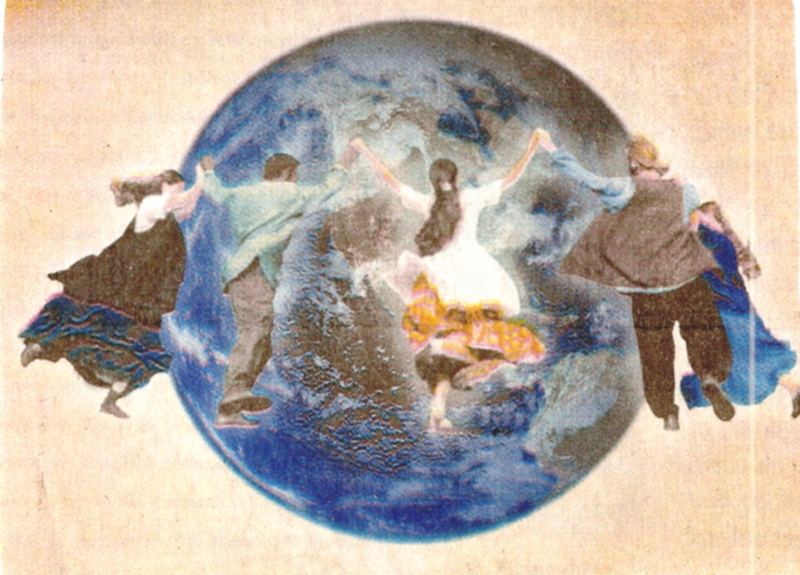 Another group circle dancing around Mother Earth. Picture taken from the following web-site:http://www.garydance.com/. Community/Family Dancing. Teaching dance at many churches. Circle Dance around Mother Earth. If time permits I highly recommend viewing the following web-sites. (Note FollowersofYah does not support the following web-sites nor the above ones). (check out the pictures with the candles and fire). Quote taken from: http://www.firstucceauclaire.org/sermons/MXP071606.pdf "After the feast of the Passover before going out to fulfill his destiny, Christ commands his disciples to join hands and dance around him in a circle. In this sacred union he makes his last request: �Now answer thou unto my dancing. Behold thyself in me who speaks�(World History of the Dance, Curt Sachs, page 54)"
Hoshea/Hosea 4:6 "My people have perished for lack of knowledge. Because you have rejected knowledge, I reject you from being priest for Me. Since you have forgotten the Torah of your Elohim, I also forget your children. "